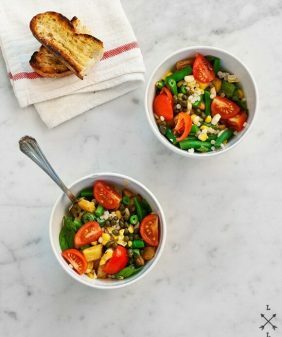 A simple summer salad - perfect for picnics and BBQ's when tomatoes are in season! I realize… this hardly counts as a recipe. In fact, I can list a whole slew of “recipes” I’ve posted that don’t reinvent any wheel or involve genius ingredient combinations. But it’s summer, and I’m of the opinion that when summer produce is at it’s peak, you should do little with it. That, or I’m starting to get lazy, I’m not sure which. Either way, this not-rocket-science salad was dinner last Sunday night. A simple & pretty way to welcome the first official weekend of summer. 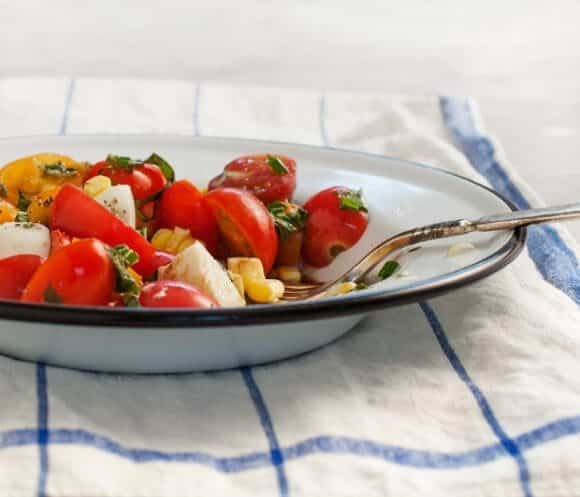 It’s a glorified caprese salad, with sweet basil oil and some crunchy raw corn. Which would be unheard of on the island of Capri, but I had some beautiful fresh corn on hand, so in it went. (I thought it was adorable that these were same size as my little tomatoes). Make the basil oil by very finely chopping 3-4 of your basil leaves, and mixing with the olive oil and a small squeeze of lemon. (you can also do this in a food processor). Let that sit while you assemble everything else. 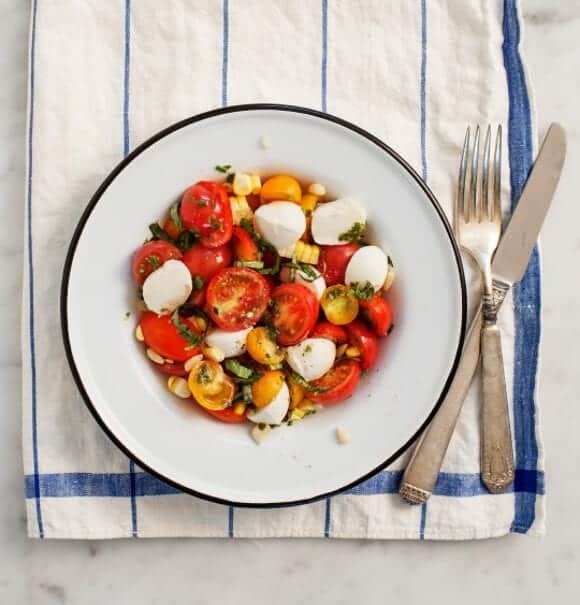 Toss together the cherry tomatoes, mozzarella, corn kernels and remainder of sliced basil with a bit of salt & pepper. Drizzle basil oil on top (however much you want), along with a splash of balsamic vinegar. Top with pine nuts and red pepper flakes. Serve with the remaining basil oil on the side. Well, it is a dang awesome recipe to me!! I love everything about it! The best recipes are often not highly complicated anyway. You post the most wonderful recipe bases which demonstrate the simple pleasures good fresh food can deliver. 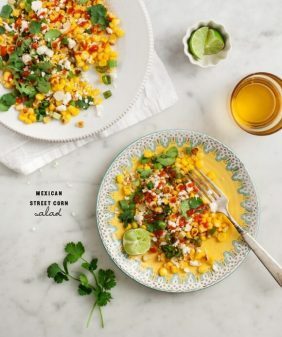 Corn – Great addition to one of my favorite summer salads when the tomatoes are at their prime! Love your pics! Simple, but divine! Can’t wait to get my first caprese of the year on! 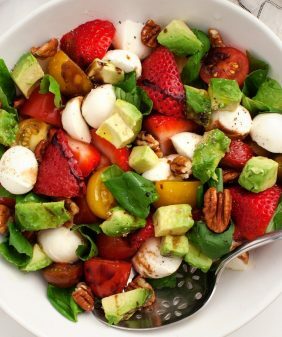 I could eat this salad every day! It does not have to be complitaced, sometimes a simple flavors are the best. 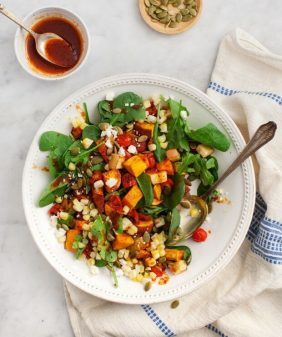 And with organic ingredients this salad muast taste amazing. Totally agree, I’m especially picky about tomatoes… these little ones were so perfect at my farmers market that day. I love how colourful this is! The best recipes are the ones that are made fresh without any fuss. This is summer in a plate. Gorgeous!! 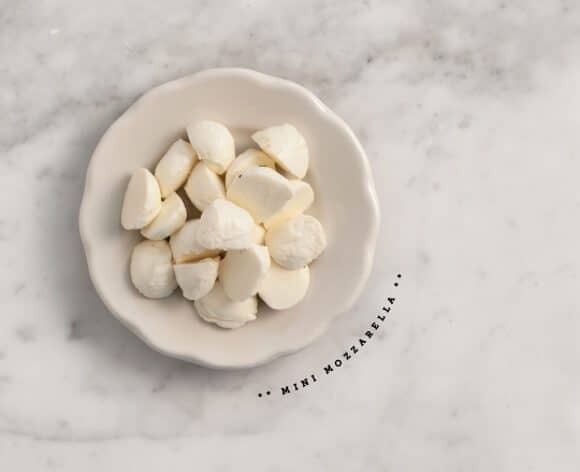 Sometimes a reminder of a delicious combination is as good as a recipe. Plus I love to see how you style thangs. Love it! 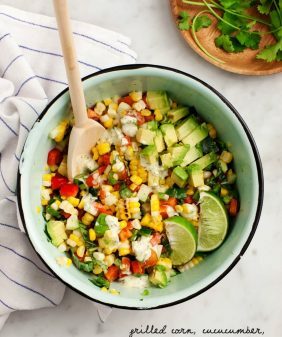 This is pretty much summer in a bowl – beautiful. Sometimes it’s the simplest ingredients that produce the best flavour combinations. When somethings good why complicate it? 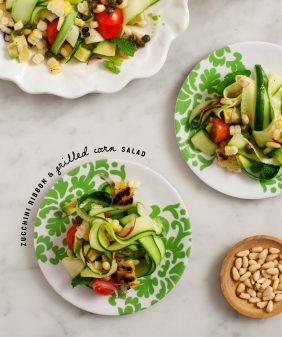 yum – perfect summer salad!! also I love you photographs – any tips? thanks! !